To the markets, it has become more vexing than the volocaust. After all, last Monday's violent move - which saw the VIX surge by the most on record and send the market into a sharp, brief correction - was not only predicted (if only by a handful) but the reasons behind the VIXplosion are largely understood, as inverse VIX ETFs experienced the equivalent of a terminal margin call, prompting the "largest VIX buy order in history." Meanwhile, Wall Street has been scratching its head to explain the recent, far more bizarre moves across asset classes - stocks, yields and the dollar - which first Citi, and then Deutsche Bank's chief FX strategist, admitted made no sense. So somehow we have embraced the theme that was with us through January. On a day when inflation beats in the US (incidentally retail sales missed): stocks are up, yields are up and the USD lower does not add up. We are well into 2018 and our feedback from recently attending the TradeTech FX conference in Miami is that the market is still struggling to understand or embrace dollar weakness. How can it be that US yields are rising sharply, yet the dollar is so weak at the same time? The answer is simple: the dollar is not going down despite higher yields but because of them. Higher yields mean lower bond prices and US bonds are lower because investors don't want to buy them. This is an entirely different regime to previous years. And while analysts can goal-seek a narrative du jour to justify any given market move at least until it reverses at which point another "explanation" is provided, what is really happening is the gradual - and on February 5th, not so gradual - unwind of a decade of unconventional monetary policy. That's the claim made by Deutsche's derivatives strategist, Aleksandar Kocic, best known in the past year for introducing the concept of "metastability", or the market's current precarious, and unsustainable, state. As Kocic writes in his latest note, those seeking the real reason behind the recent bizarre cross-asset moves, should go back in time not a few days or weeks, but years - all the way back to 2011, which is when everything changed. The Deutsche Bank strategist claims that "the current policy unwind is qualitatively different from traditional recoveries" and "the underlying complications can be traced back to the later installments of QE, around 2011, which signaled the beginning of a new regime of market functioning, an utterly new mode rarely seen to persist beyond transient episodes." 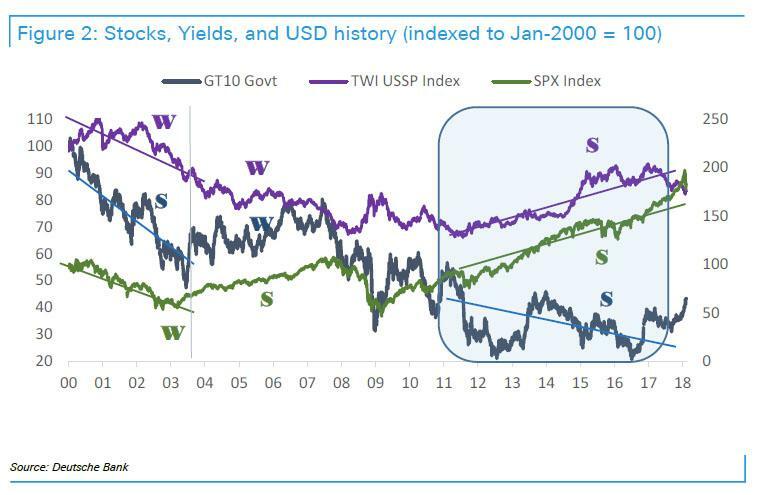 Kocic shows this regime change in the following chart, which illustrates a longer history of the three "vexing" assets in question, the USD (in terms of TWI index), S&P levels and 10Y UST yield, indexed to their Jan-200 levels. The letters S and W stand for strong and weak. He goes on to explain that "typically, stocks, bonds and currency cannot all rally at the same time for a prolonged period of time. Generally, they support each other conditionally: For two of them to rally, one has to sell off (and the other way around). This is seen in the picture during first decade of this century. 2011 signals a structural shift to a new regime." "Between 2011 and 2016, the three assets supported each other unconditionally – they rallied simultaneously. This was a result of continued QE against the background of threat of sovereign risk overseas, which created positive externalities for both USD and US stocks, and it represents the other side of the state of exception created by the extended influence of central banks." The central bank "state of exception", figuratively, is what allows the market to continue existing in its current state of metastability, as traders realize that central banks are "aligned" with their interests and against those of the broader economy, while pushing risk assets higher no matter the threat of runaway inflation, at least until the market itself becomes so unstable its folds in on itself, challenging the central bank put, a preview of which we saw on February 5. This outlines the essence of the problem of policy unwind. While central banks' actions and the market environment had clearly created optimal conditions where, for many years, every asset class made money at the same time, the natural question one had to ask is: What to expect after that? If unwind of the stimulus is its mirror image, where does one go when everything sells off? And, just like his fellow Deutsche coworker Allan Ruskin did on Friday, Kocic also attempts an explanation. Last time we saw a recovery from a conventional recession was about 14 years ago (for many, this is longer than their entire professional career). Things are different this time. Both the 2008 financial crisis and subsequent policy response were highly unconventional, and therefore there is no reason to expect that recovery and unwind of the policy response should be conventional either. [The recession-recovery path post-2008] starts, as usual, with a selloff in risk assets and a rally in bonds (1 & 2), but as the crisis deepens and QE gets deployed (3), the action moves (and stays) on the off-diagonal where both bonds and equities rally. 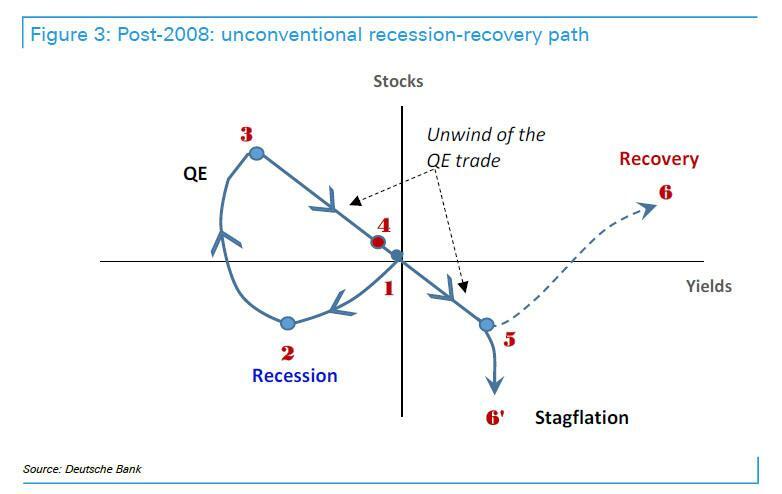 Unwind of QE now becomes essentially a de-risking move -- it goes against the grain of recovery. Currently, we are heading towards point 4, beginning to catch sight of the bifurcation point (5) from which the market could either sink into the “stagflationary” trap (6: everything: stocks bonds and currency, sell off) or move to the 1st quadrant if the Fed and Congress manage to engineer a turn around and we get catapulted towards what looks like a traditional recovery. This is the biggest challenge for the Fed at the moment, which is further complicated by the ongoing rise in volatility. This complication, which appears to come naturally in this context, is further amplified by the Fed’s negative convexity exposure to inflation. Predictably, it was the spike in wage inflation - and the resulting shift in market sentiment - on Feb 2. that culminated in a 666 points drop in the Dow and the VIX shock just one trading day later. It is also inflation that remains the "weakest link" in the Fed's strategy to perpetuate the "state of exception" indefinitely. It is what Kocic calls the "Icarus effect." Inflation is producing an Icarus effect: Although negative convexity of inflation is a far OTM risk, it is significant even at remote distances from the strike, due to its enormous size. The accumulation of relatively illiquid long-dated bonds on retail balance sheets is at toxic levels and a substantial rise in inflation, to which there is no adequate policy response, could threaten to trigger a bond unwind that the market would be unable to absorb. 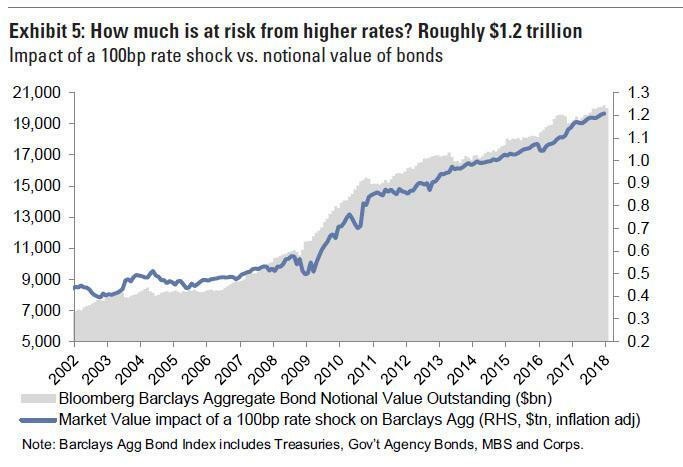 "Having UST bonds with strong dollar or high real yields will be more attractive than holding US stocks, which means accelerated de-risking and higher volatility in the stock market. Higher inflation, on the other hand, would be supportive for equities and could cause another leg of selloff in bonds." What complicates things is that the behavior of real rates at this point is also a function of expected inflation: Higher inflation warrants a more hawkish Fed and therefore pricing in higher real rates. The reaction of stocks is a non-linear function of inflation – although risk assets might “like” higher inflation, this would remain true only up to a certain point. It is this rising inflation - whether through breakevens or real rates - that takes us back full circle to the paradoxical moves observed last week in the three key risk assets categories whose convergent started in 2011 and ended with a bang last week, prompting more than one trading desk to explode at the associated complications of trading this market: complications resulting form the ongoing unwind of central bank policy. Putting it together, Kocic notes "the following three observations which summarize the ongoing complications associated with stimulus unwind and the conflicts they create in the context of economic recovery." Unwind of stimulus is a mirror image of the QE trade. It is a de-risking mode and, as such, it goes against the grain of recovery. This is in sharp contrast with conventional unwind of the recession trade, which is the risk-on mode. Risk is asymmetrically distributed between rates and risk assets. There are two distinct paths to higher rates (through higher real rates or wider breakevens). They mean two different things for bonds and stocks. For bonds, the distinction between these two paths is a matter of degree between a mild and a moderate selloff. For equities (and USD), on the other hand, the effect is binary – it means a difference between a modest rally and a substantial selloff. Volatility plays an essential role in the policy unwind. It is one of the key decision variables in the process of portfolio risk rebalancing -- higher volatility causes complications. However, unlike traditional recoveries, which are collinear with the unwind of the recession trade -- and, as such, volatility-reducing – the unwind of financial repression is withdrawal of convexity supply and a vol-enhancing mode. After years of calm and predictable markets, suddenly there seems to be many things going on at the same time. As recently as early January, the incoming vol supply could not find a buyer as vol selling and carry trade remained the dominant themes. This changed practically overnight as rates broke through significant technical levels, which triggered a spike in gamma, which quickly spread across all market sectors. With every new installment of stimulus unwind, it seems as if things are moving in reverse, but not to where we left them, rather towards what appears to be an unknown and unfamiliar destination. This is proving to be a highly unconventional tightening cycle and recovery. ... which takes us to his prediction of what comes next. The simple answer: "pain." After years of forced hibernation, brought about by suspension of traditional trading rules by the central banks, the markets are facing a painful process of re-emancipation. This is causing considerable confusion and anxiety. Finally, for those "confused and anxious" about the catalyst for the next cycle of pain, look no further than volatility, and specifically where it goes from here - its trajectory will determine the fate of not only the market but also the economy, to wit: "In the subsequent months, a particular pattern of volatility, in terms of its breakdown across different assets, will determine the mode of risk rebalancing. In that context, volatility will play a decisive role in determining the success and timing of the recovery and a particular economic trajectory."